To date, I haven't found anything that couldn't be enhanced by a glass of red wine. Imagine my surprise, then, when I discoverd my chosen World Of Cine were offering vin rouge, by the glass, behind the very counter where I was purchasing my ticket. The fact I was there to see The Grand Budapest Hotel just rounded off what promised to be a great evening. All that was missing was some olives and cheese. So, wine in paw, and a perfect seat free and available in a pleasingly full Screen Five, I settled down for what I hoped would be another fine Wes Anderson offering. Now, I'm not saying I'm a huge fan of the Wesster - The Darjeeling Limited left me cold - but when he hits, like with 2012's Moonrise Kingdom, no one can touch him. And from the trailers, it looked like this was going to be another sublime cinematic experience. 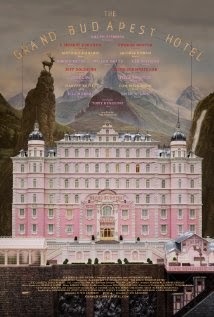 Inspired by the writings of Stefan Zweig (no, me neither), The Grand Budapest Hotel tells the tale of Zero, a trainee lobby boy taken under the wing of esteemed concierge Gustave. The story takes us through the death of Madame D., a stolen painting, murder, prison, more murder, a ski slope, some cakes, the breakout of war and a shoot out. All in a smidge over 90 minutes. It's nothing short of brilliant. For a start, the casting is spot on. Ralph Fiennes (Gustave) has never been better, camping it up and oozing class and sleaze like he was born to play the role. Tony Revolori, meanwhile, is perfectly balanced as Zero, underplaying his role while Fiennes tears it up. It should be the making of a great double act. The comic timing of the pair is just superb, deadpan deliveries abounding while the physical comedy is delivered as if they were a couple of seasoned pros. And it's a measure of just how good the pair are that they are in no way overshadowed by the stellar line-up Anderson has assembled around them. In no particular order, Harvey Keitel, Jude Law, Jeff Goldblum, Tom Wilkinson, Bill Murray, Saoirse Ronan, Edward Norton, Owen Wilson, Willem Dafoe, F. Murray Abraham, Adrien Brody, Bob Balaban and Tilda Swinton all pass through (some staying longer than others) and acquit themselves with aplomb. And you won't recognise at least three of those until the credits roll. But, amazingly, none of these are the stars of the show. There is no flab on this film - not a shot, not a frame, is wasted. And it all looks stunning. From the opening scenes, the travels back in time (taking the aspect ratio with him) and the closing scenes, it's like watching one long work of art. All the more fitting, given that Boy With Apple - a masterpiece left to Gustave - is at the centre of all the comic capery. It doesn't matter if we're at The Grand Budapest, out on the ski slopes, on a train stopping by a barley field or hiding in a museum, each scene is filmed with such care and attention to detail that it is clear we are in the presence of a man at the top of his game. It's so perfect, in fact, it can almost be a distraction. Like finding a hidden gem in an art gallery, some scenes can so steal your attention you can almost forget you're actually watching a film. Fortunately, Anderson clearly knows this, because that's usually when another gag pops up and reminds you why you're sitting in your comfy cinema seat with your wine. Even, though, with the fine writing, acting and shooting of Grand Budapest - all of which, if I haven't laboured this point enough, are near perfection - there is still one thing that steals the show from everything else. What shines through in every scene, in every frame, is just how much love has gone into this film. The cast are clearly having the time of their lives, but behind the camera Wes is basically writing a love letter to the art of film making. From the carefully chosen pallets to the ere-sensitive use of the aspect ratios (I counted three different ones, but I may have missed one), this is a film made by a film lover for film lovers. Nothing is left to chance, and every scene bears repeated watching as you'll have missed something the first time, and by the end you're just left grinning in a warm glow. In an era where people pay money to see Michael Bay's efforts, the fact this screen was packed for a quirky, oddball romantic comedy crime caper that almost defies description (never mind genre classification) goes some way to restoring one's faith in humanity. Just keep your hands off the lobby boy. The ere sensitive aspect ratio? Eh? Otherwise I agree, what a beautiful looking film. For me though sometimes the comedic pratfalls etc were only one step away from being accompanied by cartoon noises. But overall, a joy which I reckon will bear watching time after time. BTW only caught up with Djahdeeling the night before seeing this. Got to the end and thought wtf? However, it did whet the appetite. What a feast followed. Yeah, I couldn't think of a less pretentious way of saying that. Sorry.